Rig Engineering is a young, dynamic international Engineering Services company. 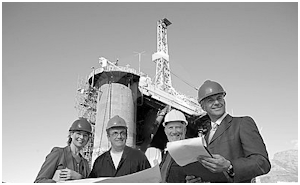 The main aim of the company is to provide value for money technical services to the Drilling Industry. We work alongside our clients to find the best realistic design solution that offers genuine commercial benefits. Our Senior Management Team is composed of highly qualified, experienced professionals who have extensive managerial experience in a variety of business aspects including engineering, construction, sales, marketing and management. The founders of the Company also have substantial experience in all aspects of hull, fabric and structure asset management including condition assessment; class requirements; solution development; budget preparation; contract preparation; financial control; implementation; and close out development. This experience has been gained across the industry on all forms of facility from shallow water jack-ups through semi-submersibles to accommodation platforms. The combination of experience, competence and product line, represent a formidable entry into the industry asset repair and maintenance market. Conveniently formed to operate alongside and or within the customers operations and maintenance functions, acknowledging existing financial accounting protocols, whilst respecting the customer’s technical requirements, and reporting needs. Common barriers to successful implementation are removed, thus releasing the enthusiasm, energy, and synergy that come from an integrated team. For the duration of a project, the solution team is quite simply an extension of the customer. Bringing to the asset owners a proven structured approach together with a packaged solution that affords the customer the maximum protection from exposure. We are ISO 9001 management system certified. Integrity, Financial Discipline, Respect for People, Excellence, Honesty, Leadership and Tenacity. The company management fully support these core values as being of high quality, and sustainable; and considers they are well aligned to those of the current and future client base. The Company offers Turnkey Asset Management solutions, Client Integration, Projects on time and on budget, Reduced Client overheads, Tight Project Controls, Driven Project Execution, and Track record.